NATURAL SPLIT BLACK MIDNIGHT COBBLESTONE ON MESH SHEETS WITH A NATURAL SPLIT SURFACE AND NATURAL TUMBLED EDGES. SHEET SIZES ARE 500X500MM AND INDIVIDUAL COBBLESTONES ARE 90 X 90 X 22mm – 25mm THICK APPROX. 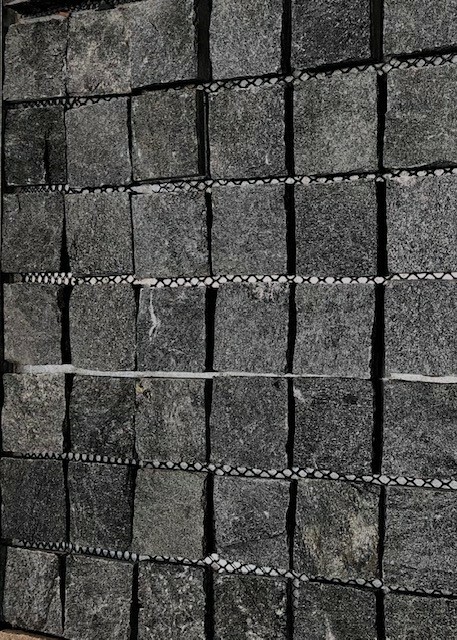 NATURAL SPLIT BLACK MIDNIGHT COBBLESTONE ON MESH SHEETS WITH A NATURAL SPLIT SURFACE AND NATURAL AND EDGES. SHEET SIZES ARE 400X400MM AND INDIVIDUAL COBBLESTONES ARE 90 X 90 X 22mm – 25mm THICK APPROX.